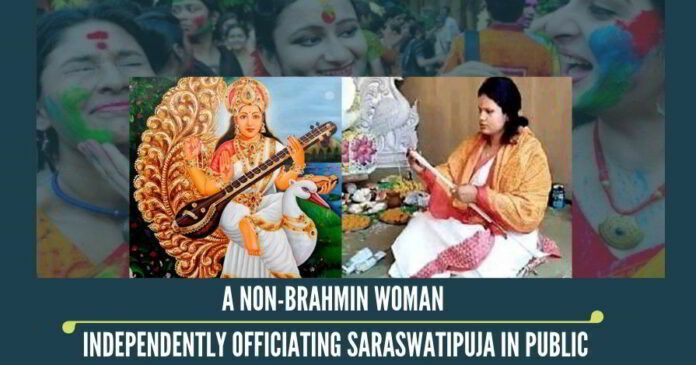 This year’s Saraswati Puja in West Bengal witnessed a rare sight when a woman was seen playing the role of a Purohita (priestess) in a major puja event held in Malda college. Sulata Mondal, a 24-year-old former student of this college publicly officiated the rituals of worshipping the Hindu goddess of knowledge, music, art, wisdom, and learning on the auspicious occasion of Basanta Panchami. In the present-day Hindu culture, the profession of the priesthood is completely dominated by males, precisely by the Brahmins based on birth. But, Sulata belongs to the Namashudra background, positioned at a lower level of caste hierarchy in Bengal. And, she is not alone: Ramani Kisku and Nita Koda, two tribal girls also conducted the Saraswati puja this year in her locality at Kalaiberiya in Bankura district of West Bengal. Many devotees were pleasantly surprised with this new development and many regarded this as a reclamation of Bharat’s ancient legacy of gender-equality and caste-independent place for everyone in the society; everyone expressed their satisfaction before media after listening to the authentic Sanskrit verses recited by the priestesses. The organization plans to train at least another 10 women in next few months who can independently officiate the worship of Goddess Durga in public puja mandaps in coming October. Devdutta Maji, the President of the Bengal based social organization, SinghaBahini started this initiative last year. According to him, so far seven girls have taken this training, out of which four belongs to tribal society and rest of them comes from scheduled caste background; 5 of them have taken part in this years’ Saraswati puja. The organization bears all the cost of training these girls by a reputed Vedic Scholar, finally, the organization issues the certificate to them after successful completion of the four-month course. Interestingly, the girls were also given martial art training for self-defence during this training. Devdutta says, “in ancient Bharat, scholar women like Ghosha, Maiytrei, Lopamudra and many other sages contributed in composing hymns of the oldest text of the world, Vedas. There was no place of birth based Varna, but respect based on Guna (virtue) and Karma (action).” According to Sulata, who played the role of independent priestess for Malda college event, any person outside the Brahmanical framework is allowed to conduct the puja rituals as per Yajur Veda. Women, irrespective of cast and social background do the worshipping of the Almighty manifested as male and female deities in a majority of the Hindu households. But they are rarely seen doing so in public events in Indian society. In a few cases, women over the years have taken training to perform worship rituals from different such schools, popularly known as toll. Sometimes, among brahmins the women are seen to assist their father or husband in public pujas, but not as an independent priestess. Even in abroad, for example in Chicago (USA), Moskow (Russia) and Leicester (UK) Hindu women have been seen playing the role of the priestess in the past. But all of them are examples of isolated efforts without any sustainable implications. Earlier Pune, Maharashtra saw similar initiative being taken by an institution called Gyan Prabhodini which along with other institutional efforts trained around 700 Hindu women from a various societal background in a span of four decades. But even such sustained effort has not been able to make this concept acceptable to a larger society throughout Bharat at the mainstream level. This is where this initiative by SinhaBahini stands somewhat unique. Convincing the orthodox school of thoughts about the right of worshipping deities stretching equally to both the genders is not an easy job; it becomes even more difficult to establish someone from a non-brahmin family into this very socio-religious structure. One needs theological convictions as well as organizational strength to make this gain social acceptance at larger scales. Theological convictions alone have been found wanting to make such efforts a societal movement. The current efforts of SinghaBahini thus stand out as historic as an institutionalized effort finding acceptability on the ground and the organization plans to train at least another 10 women in next few months who can independently officiate the worship of Goddess Durga in public puja mandaps in coming October. Durga Puja, being the biggest and most popular religious carnival in eastern India attracts millions of devotes each year from across the globe and therefore, it will be the ideal challenge for these women to permanently establish their rights as Purohitas in the Hindu society. Interestingly, this year in Kumbh mela at Prayagraj, the largest congregation of mankind on earth witnessed transgenders from Kinner akhara and a Dalit ‘Mahamandaleshwar’, the first scheduled caste to be made the head of Juna akhara taking the special Sahi snan. Many professional purohits (male priests), even religious heads have expressed their reservation to such initiative in the past displaying religious prohibitions. However, it is not hard to understand the insecurity related to this field of occupation for some of them. Because, in Sanatan Dharma tradition, Hindus have been blessed with a continuous, unbroken chain of women Saints, Yoginis, Nuns (Saadhvi), Priestesses (Panditaa), Ascetics (Bhikshuni) and Seers (Rishika) who have carried the eternal message of our Dharma. A Brahmin by definition is someone who has acquired the knowledge of the Brahman or the Supreme Being; thus, anyone irrespective of his/her social backdrop can become a Brahmin and perform the rituals of worshipping the deities. The entire Shakta sect of Hinduism is dedicated to worship of Brahman in feminine form. The concept of the Feminine Divine is integral to the Hindu belief system. In Shaiva tradition, God often represented as a half woman (Ardhanarisvara) depicting the Shiva & Parvati in a composite androgynous form, whereas in Vaishnava tradition, Vishnu sometimes worshipped in the Vaikuntha-Kamalaja (Vishnu & Laxmi) form; Vishnu often incarnates as a woman to preserve and protect Dharma (Mohini avatar). Several mantras from Yajurveda (e.g. Sukla YV 5.17) specifically recited by women. Gayatri (a.k.a. Savitri), is regarded as the Mother of Vedas (Atharva Veda 19.71.1); both male and female deities are extolled in the hymns (‘Apri Suktas’) of all revealed texts of Hindus and in the family prayers of all the 10 lineages of Vedic Sages. Vac Sukta (Rigveda 10.125) dealing with a revelation of Vedas is attributed to Rishika Vagambhrina. Vedic texts often referred to in feminine, e.g., Shrimati Rigveda Samhita. However, thousand years of racial and religious oppression by external invading forces caused the followers of Indian Sanatan Dharma to become defensive, temporarily regressive which have taken time to recover, specifically in the front of gender-equality for women. According to President Devdutta, SinghaBahini is blessed with hundreds of devoted workers who have been involved in various social and dharmic activities for over a decade now. Therefore, with the spiritual knowledge acquired from the above-mentioned examples, these people are motivated enough to take the pledge and make this effort a sustainable one. Already, the mainstream printing media houses like the Times of India, The Statesman and Aajkal Patrika and quite a few electronic media channels have spontaneously covered this story. Dr Souptik Mukherjee, a research scholar from the US who had been promoting the idea for long and had worked with Devdutta Maji was ecstatic. “Establishing absolute spiritual equality for all, both men and women on the ground, as given in Dharmic Scriptures like Bhagavad Gita is a huge step in ensuring larger societal unity. If scaled up can have significant implications in terms of participation of women in defending and preserving the faith”. Response from different sects of the civil society has been very impressive: some believe that in terms of redefining the religious customs, it is a historical moment in Bengal, the birthplace of the renaissance in India; some said that this is an idea they had cherished for a long time, but only became a reality today. It will be interesting to see how this support from the mass takes this progressive initiative forward to re-establish the gender-equality and a cast-less society in Bharat. It must also send a message to the women belonging to the other religions to come forward and ask not only for their rightful participation but acquire a leadership role in public religious activities. The author obtained his PhD degree from Jadavpur University, Kolkata and is currently doing his postdoctoral research in the United States of America. What a biased article. It seems pgurus is being taken over by leftists and pseudo liberals. Why am I saying that? You have to read a few other articles on this website that describe how caste was imposed on Indian society by the British and other Europeans. Try and examine the language of this article on that backdrop. This article seems to assume that caste based on birth is/was a permanent feature. It then tries to claim that things are changing for the good. Perhaps, the author is trying to please his boss. This is a submission by an enslaved mind. It describes the events well, but it needs to be fully rewritten to bring it in line with the proper narrative that this website and other tireless workers in the field of indology are trying to establish. I am very happy to read this. It is the way forward for India.